The ear canal, also called the external auditory meatus, is the other important outer ear landmark. The ear canal is lined with only a few layers of skin and fine hair, and is a highly vascularized area. This means that there is an abundant flow of blood to the ear canal. Wax (cerumen) accumulates in the ear canal and serves as a protective barrier to the skin from bacteria and moisture. Ear wax is normal, unless it completely blocks the ear canal. The ossicles are the three tiny bones of the middle ear located directly behind the tympanic membrane. These three bones form a connected chain in the middle ear. 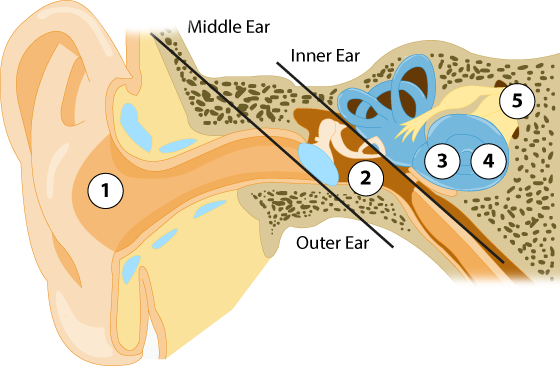 One of the bones is embedded in the innermost layer of the tympanic membrane, and the third bone is connected to a membranous window of the inner ear. The ossicles take mechanical vibrations received at the tympanic membrane into the inner ear. Semicircular canals – These structures do not contribute to hearing, but assist in maintaining balance as we move. Cochlea – This is the hearing organ of the inner ear, which is a fluid-filled structure that looks like a snail. The cochlea changes the mechanical vibrations from the tympanic membrane and the ossicles into a sequence of electrical impulses. Sensory cells, called hair cells, bend in the cochlea as the fluid is disrupted by the mechanical vibrations. This bending of the hair cells causes electrical signals to be sent to the brain by way of the auditory nerve. The cochlea is arranged by frequency, much like a piano, and encodes sounds from 20Hz (low pitch) to 20,000Hz (high pitch) in humans.